Locating John Milton’s works in national and international contexts, and applying a variety of approaches from literary to historical, philosophical, and postcolonial, Milton and Toleration offers a wide-ranging exploration of how Milton’s visions of tolerance reveal deeper movements in the history of the imagination. Milton is often enlisted in stories about the rise of toleration: his advocacy of open debate in defending press freedoms, his condemnation of persecution, and his criticism of ecclesiastical and political hierarchies have long been read as milestones on the road to toleration. However, there is also an intolerant Milton, whose defence of religious liberty reached only as far as Protestants. 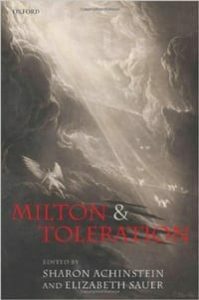 This book of sixteen essays by leading scholars analyses tolerance in Milton’s poetry and prose, examining the literary means by which tolerance was questioned, observed, and became an object of meditation. Organized in three parts, ‘Revising Whig Accounts,’ ‘Philosophical Engagements,’ ‘Poetry and Rhetoric,’ the contributors, including leading Milton scholars from the USA, Canada, and the UK, address central toleration issues including heresy, violence, imperialism, republicanism, Catholicism, Islam, church community, liberalism, libertinism, natural law, legal theory, and equity. A pan-European perspective is presented through analysis of Milton’s engagement with key figures and radical groups. All of Milton’s major works are given an airing, including prose and poetry, and the book suggests that Milton’s writings are a significant medium through which to explore the making of modern ideas of tolerance.